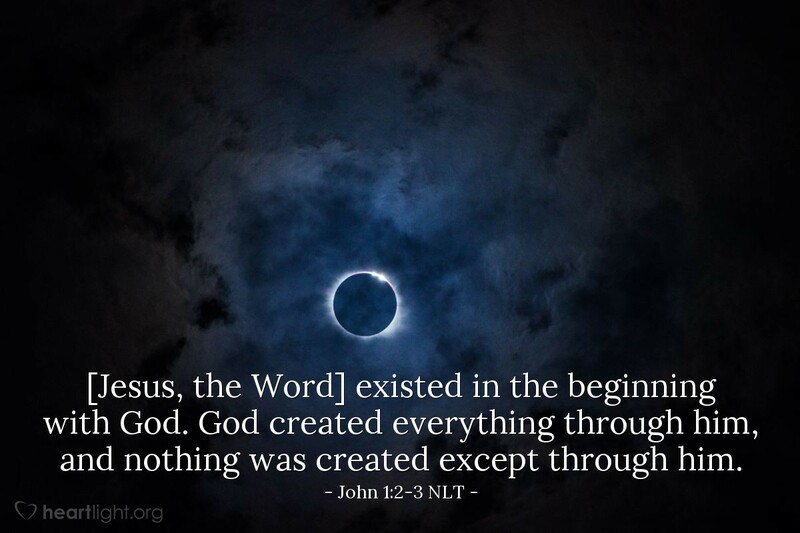 [Jesus, the Word] existed in the beginning with God. God created everything through him, and nothing was created except through him. The things you see in creation that are beautiful, the things you find marvelous in nature, and the things that astound and bewilder you in our universe came into existence through the one who allowed himself to be born as a human baby and placed in a manger. His fingerprints are on all of creation. His power gave birth to the universe, and his ongoing word sustains it. Ponder that last phrase, and then realize both the enormity of it and the personal connection to it: the Word, Jesus, God who would come in human flesh, made everything in the universe — including you and me! He is great, awesome, and beyond description, and yet he made you and me! He is incomprehensibly powerful, yet he cares enough for us to come to earth and die for us. The Creator is also the one about whom we sing: "Jesus loves me! This I know,...."
Precious Jesus, thank you for knowing me and caring for me. You know my flaws, yet you died to redeem me from them. I know you made me special to serve in your Kingdom, so please help me be able to identify those things that I should be doing to fulfill your purposes for my life. Father God, please accept my undying gratitude and praise for your plan and for the love that it took to send Jesus to earth for me. I offer these words of thanks in the name of Jesus, heaven's Message and my Creator. Amen.